The 11th Polish Cup OYAMA TOP in knockdown took place in Kozienice. About 40 female and male fighters, representing 16 Oyama karate clubs, took part in the tournament. The event was organized by Nadwislanski Klub Sportow Walki WULKAN with its leader Sensei Andrzej Suwala 3rd dan. The tournament was held under the patronage of local authorities and Hanshi Jan Dyduch 8th dan, the president of OYAMA Polish Karate Federation. Shihan Andrzej Pierzchala 5th dan OYAMA IKF director of schooling division was also present during the competition. Shihan Pawel Pajdak 5th dan (Sosnowiec) was the head referee. The duties of the field referees were fulfilled by Shihan Witold Choinski 5thdan (Bialystok), Sensei Rafal Majda 4th dan and Sensei Boguslaw Plewka 4th dan (Lubliniec). The competition was at very good sports and organizational level. The winners of the OYAMA TOP category received impressive cups and financial prizes, sponsored by OYAMA Polish Karate Federation. 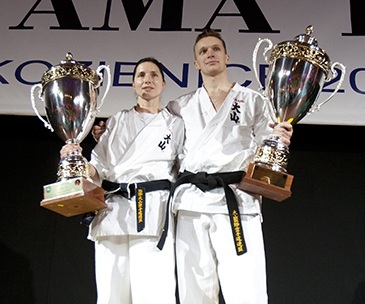 The Cups for the Best Fighters of the OYAMA TOP went to Anna Kolodziej-Plewka from Lubliniec and Lukasz Luczynski from Kozienice.